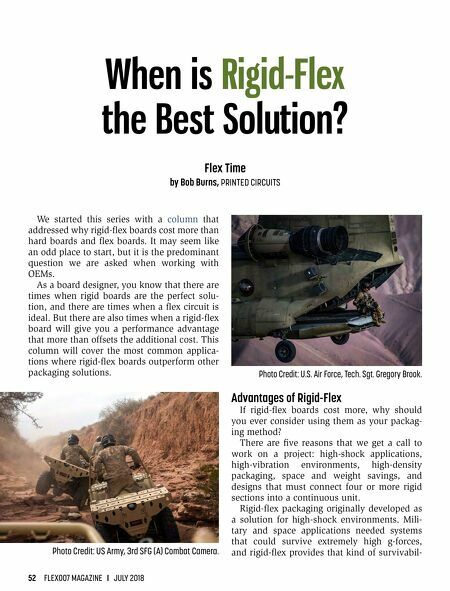 52 FLEX007 MAGAZINE I JULY 2018 We started this series with a column that addressed why rigid-flex boards cost more than hard boards and flex boards. It may seem like an odd place to start, but it is the predominant question we are asked when working with OEMs. 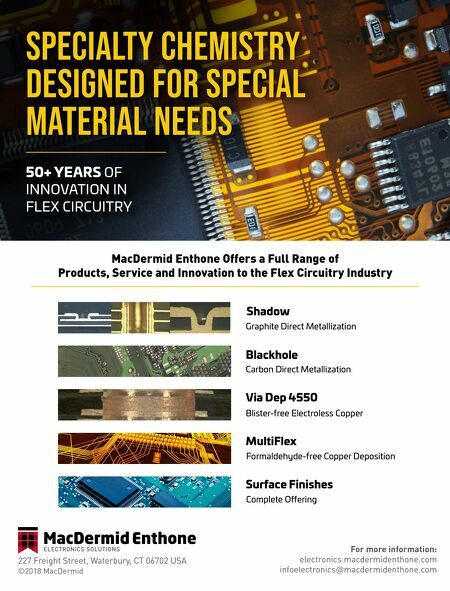 As a board designer, you know that there are times when rigid boards are the perfect solu- tion, and there are times when a flex circuit is ideal. But there are also times when a rigid-flex board will give you a performance advantage that more than offsets the additional cost. This column will cover the most common applica- tions where rigid-flex boards outperform other packaging solutions. Advantages of Rigid-Flex If rigid-flex boards cost more, why should you ever consider using them as your packag- ing method? There are five reasons that we get a call to work on a project: high-shock applications, high-vibration environments, high-density packaging, space and weight savings, and designs that must connect four or more rigid sections into a continuous unit. Rigid-flex packaging originally developed as a solution for high-shock environments. Mili- tary and space applications needed systems that could survive extremely high g-forces, and rigid-flex provides that kind of survivabil- Flex Time by Bob Burns, PRINTED CIRCUITS When is Rigid-Flex the Best Solution? Photo Credit: US Army, 3rd SFG (A) Combat Camera. Photo Credit: U.S. Air Force, Tech. Sgt. Gregory Brook. Column — When is Rigid-Flex the Best Solution?